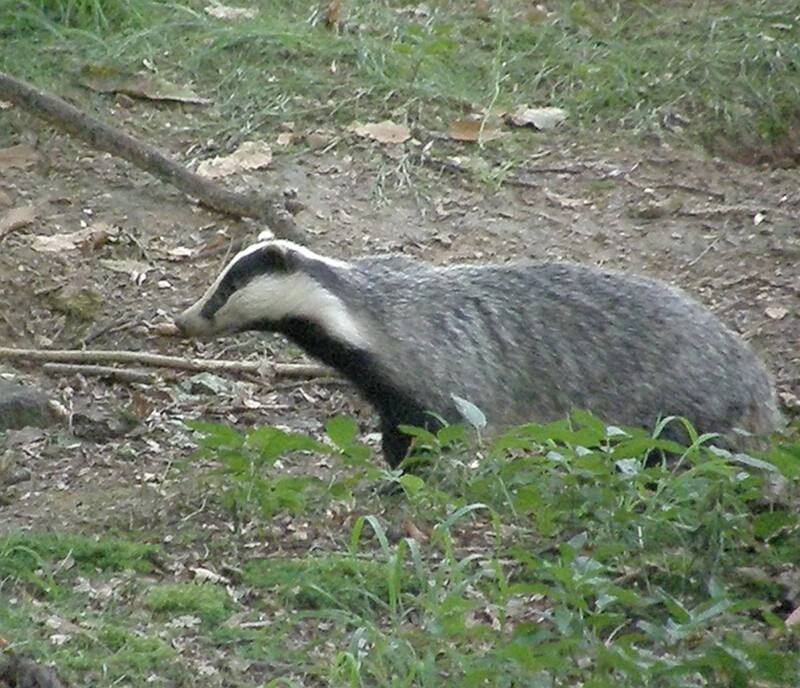 « Fieldnotes: 30th May 2010 – Why do badgers move within the sett? Watching badgers, in theory, should be quite simple. All you need to do is to find an active sett and be there (suitably downwind and out of sight) when the badgers come out in the evening. I’ve covered the first part – finding an active sett – in an earlier post (see How to Recognise a Badger Sett). Now I’ll say a little about the second part – when the badgers come out of their sett. Badgers are nocturnal: they sleep during the day and are active at night. They emerge from their sett in the evening to play, socialise and forage. Unfortunately for the badger watcher they don’t come out at exactly the same time every evening. They vary the time of emergence from day-to-day and month to month. Generally speaking, the time that badgers come out is governed by the time of sunset, earlier in winter and later in summer. It is a little more complicated than this though, as they will often emerge while it is still light. Badgers need enough time to find food, so during the summer when nights are short they will come out before the sun has set to give them sufficient foraging time. In winter, when the nights are longer and the badgers are less active, they will emerge well after dark. There are other factors that affect the time of emergence though. Neal and Cheeseman, in the classic book Badgers, list a number of these. For example, badgers will come out later when there is more light. Those in a sett that catches the light of the setting sun may well emerge later than those in a sett that is in shadow. Nights when there is a bright moon may also mean the badgers come out later. Weather plays a role too. Badgers may come out later in strong wind or heavy rain, probably because they cannot detect danger as well in these conditions and they feel less secure. Linked to weather is the availability of food: damp nights are better for catching worms so the badgers may come out earlier to feed. On the other hand, a prolonged dry spell may also see them coming out earlier as they are under pressure to find food and need to spend longer foraging. The same may be true of sows with cubs, who according to Neal and Cheeseman are often the first to leave the sett in the evening, presumably to get as much food as possible. Lastly, human disturbance may keep the badgers underground for longer. Setts that are subject to regular human activity tend to emerge later. All of this means that whilst it is possible to estimate the general time that the badgers will emerge, predicting the precise time is much more difficult. Here’s where this blog comes in. The main reason for writing this blog is to provide a journal for my experiences, to record details that hopefully will prove useful at some point in the future. Since the beginning, one of the things I have been careful to record is the time that the badgers emerge from the sett. My hope was that by keeping track of these I’d be able to find a pattern and be able to predict their movements much more accurately. 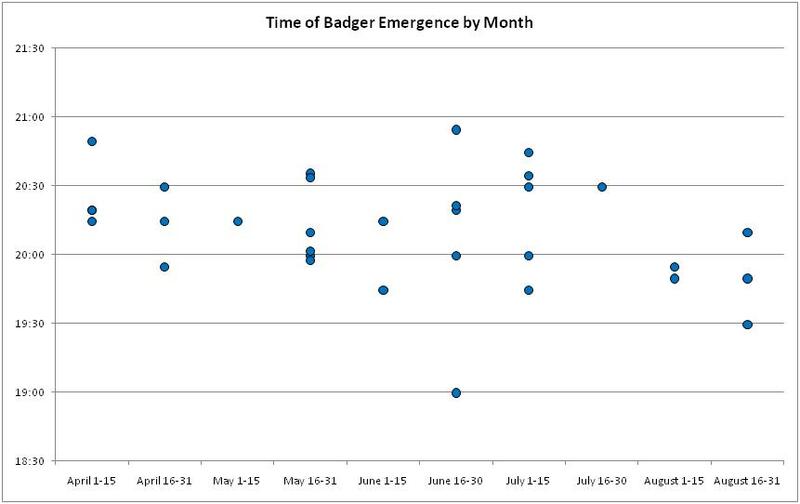 I’ve now had a chance to look back through the archives from the last two years and plot a graph of badger emergence times at different times of year. Each point on the graph represents a time when the first badger emerged from the sett. To show how this varies across the year I have split the graph into half-months. I obviously don’t do enough badger watching before April and after August! The first thing to notice is that there is a wide range of times in each month, so there is a lot of variation in times of emergence. In June, for instance, the badgers have come out as early as 7.00pm and as late as nearly 9.00pm. The 7.00pm event may have been an anomaly – it was an undersized cub that acted strangely – but there’s still a big variation. The data set for the graph is statistically too small to support firm conclusions, but it still helps to build a picture of emergence. For instance, it does seem that the badgers come out slightly later in May and June than they do in August. The graph also shows that in almost all cases the badgers emerged after 7.30pm and usually around 8.00pm, so it does at least allow me to judge the time I need to arrive at the sett. Neal and Cheeseman have a much better graph in their book, based on hundreds of observations. Anyone interested in the subject would be well advised to have a look at it. Nevertheless, I’m quite proud of this little graph of mine. It’s based on my own fieldwork and the records I’ve kept of my own experiences. If you are thinking of going to watch badgers I hope it is of some use to you in planning your visits. on June 4, 2010 at 6:04 pm D.d. Everything else is pretty nice! Yes, a trendline would be good. I could try to make the excuse that I wanted the data to show variance and not averages, but the truth is that I couldn’t figure out how to make Excel 2007 produce a true scattergram. The graph is actually 6 or 7 line graphs without the lines, which means that I cant easily add the trendline. And yes, it would be good to plot weather, phases of the moon and so on. I try to record the weather on here too, so it would be possible to get the data. I probably don’t have enough data points to make it useful yet, but it’s something to aim for in the future. Thank you for a very interesting and helpful post. A couple of friends and I are going badger watching tomorrow evening and your time frames have given us a useful guide. I will report back! Interesting read thanks for sharing, I was urban fox watching last night, there is a badger set next to the fox den, could even be sharing, this is on an old railway line that has been tarmacked over so loads of people walking, running, cycling etc. The foxes are very brave and watched them all frolicking and foraging. Now i love photography and video and would love to capture the badgers and foxes but due to the amount of people, i thought perhaps an early morning stint would be best? Would badgers still be active at sunrise, if i got there say 1 hour before sunrise?